I am Mapuche from Chile; born in a Mapuche community called Lefweluan. I am a Mapuzugun speaker, an original language that is also used in parts of Argentina. This language has about 150,000 speakers; which is approximately 10% of the Mapuche population. Currently, I work for Department of Education, Santiago University of Chile. In this presentation I will talk about the present state of indigenous languages and the future of aboriginal languages, as well as, the tensions and challenges for the process of language revitalization ​​in the context of diglossia and the effects of there being a dominant language culture. Languages ​​are part of fundamental human rights, without language we cannot be human, because language is part of the human brain and it constitutes the way in which we generate thought, build and rebuild the world and create ideas. So the role of indigenous languages is invaluable for the cultivation of indigenous culture, developing values ​​and people’s creativeness. As a vehicle of culture, indigenous languages allow the cultivation of identity and enable intercultural practice, the reproduction and transmission culture. Through dialogue with the other people we are enable to exchange knowledge, know each other and appreciate the world around us. Without language, this would be impossible for indigenous people. Despite its importance to human knowledge, indigenous languages ​​now face complex and difficult issues in order to evolve and stay alive; but they have also conquered a place within dominant society, rich experiences and cultural resistance through various survival strategies and creative actions that have allowed people to keep language alive through poetry; for instance. In the case of Chile, there is no recognition of linguistic rights for people, but internally there are initiatives among the communities involved for the empowerment of language which offer hope for the future in spite of cultural colonization. In Chile there are nine indigenous languages: ​​Aymara, Quechua, Rapa Nui, Mapudungun, Yagan, selknam, Kawesqar likan antay, diaguita. The last five are in an advanced state of displacement, and the last two do not have any native speakers. The other languages, aymara, quechua, rapa nui an mapuzugun have maternal speakers, although there are very few children who currently speak them. According to the Casen survey from 2009, only 12% of the indigenous population speaks and understands indigenous languages. The majority of them are over 60 years old and 77.3% admit to not speaking or understanding their native language(s). Losing languages ​​means losing knowledge and as the human species is being threatened by the destruction of biodiversity, it is also exposed to the danger of losing its diversity of knowledge (Hinton, 1999). Peoples’ knowledge and values ​ are devices that enable the solution of many problems affecting a given population. This loss of indigenous language which was not the voluntary choice of the peoples, but rather, was the result of the political oppression that has befallen them, as well as the loss of land and the imposition of a way of living along of centuries of colonialism, and today neoliberal economics and national and global policies that seek homogenization of minority cultures is enhanced. Although Chile is a culturally diverse country, officially all Chileans have not assumed diversity and there are few public policies designed to promote indigenous languages; for cultural and linguistic diversity are considered problems to be solved. Since 1996, and with the Indigenous Law, 19.256 a bilingual intercultural education program was created for indigenous populations by the Ministry of Education. However, native languages ​​were not formally taught until 2008, when the General Law of Education is installed (LGE), which provides diversity among its principles, however, education programs remain homogeneous. During 2008, Decree No. 280 was adopted with respect to bilingual education. It created a subject on indigenous languages ​​in the official curriculum of elementary education and its effect is to allow schools with a representation of indigenous students (more than 20%) to teach indigenous languages (Aymara, Quechua, Rapa Nui and Mapuzugun). Today bilingual and intercultural education in Chile is based on one subject relating to indigenous languages, thereby neglecting the majority of indigenous children living in the city. They are the children of migrant parents, whose population reaches 70% of the total indigenous population, and yet they do not receive bilingual education, because the subject applies to primarily rural areas, where there is a higher concentration of indigenous populations, but less people in total. As women we denounce the infringement of our linguistic rights that is limiting the freedom to speak our languages in all areas, both public and private, and especially to education and its use in academic level. With the disappearance of indigenous languages, traditional knowledge and the future of our peoples are disappearing. 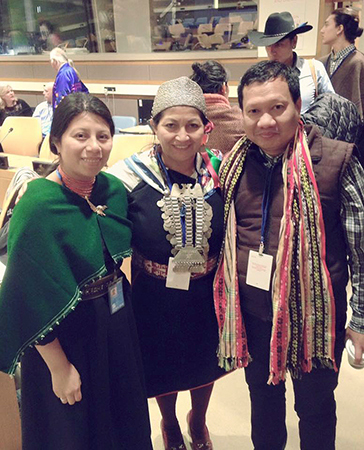 In order to ensure the survival of their languages, indigenous peoples require recognition of their status as subjects of linguistic rights ​​and for those rights to be respected in the sense that they are allowed to make public use of those languages. It is also necessary to promote awareness of language rights. If a speaker knows his or her rights, then he or she can defend those rights and appeal for them to be respected. On the contrary, if you do not know your rights, you will always feel that speaking that language is synonymous with poverty, ignorance and return to the past as is the current discourse that promotes the dominant and colonial culture. In the revitalization of the language is also important to consider the role of indigenous women because they represent 50% of the total population of each aboriginal nation, although women’s leadership is not recognized because of the macho culture that is widespread in indigenous society. The Indian man is more empowered, heard and seen as a leader, while the woman’s leadership is performed in silence since she mainly works in the practical cultivation of ancestral culture, linking the language, with labor, with food, and so passes the culture on. The education of children is mainly done by women and in doing so they must fight poverty and racial discrimination. The discrimination of indigenous women is 3 times higher than that of non-indigenous women. To be poor, a woman, and indigenous, and creates hardships that force her to abandon her aboriginal culture and language. Therefore, we must work start programs that reinforce ancestral knowledge; stop indigenous women’s discrimination and that let them continue teaching their language and culture to their children. Another important area to address with regard to language revitalization is the use of indigenous languages ​​in the urban context. Because of the migration process; the majority of the indigenous population lives in the city. The city has advantages and disadvantages for teaching aboriginal language; their disadvantage is the lack of a relationship between people and nature, because one fundamental indigenous value is to keep the balance between humans and nature. However, the city offers other opportunities, such as the use of technology for teaching and school experience. In Chile, indigenous organizations have created urban microcenters for cultural practice around Ruka Mapuche (Mapuche house), in that space people practice the ceremonies, traditional games, workshops on traditional medicine as well as intercultural education. These are community cultural centers. They have also started language courses in universities; there are language courses in the three major universities; but also in smaller universities such as ARCI; Academia de Humanismo Cristiano University, University of Silva Henríquez. To teach language we need a good method and appropriate context for the language and culture that is required in urban space; teaching books, game strategies, artistic opportunities and sufficient curricular materials that do not yet exist today, because those courses are experimental and do not belong to a long term program, with sufficient economical and human resources. Also, there are innovative programs to promote indigenous languages ​​in the media and people’s shared experiences, in order to generate more awareness about linguistic diversity among young people. In the Chilean experience, there is a gradually increased awareness about indigenous languages and there are autonomous initiatives about immersion language courses, which are promoted by young people who visit rural communities for about two weeks with a training program in the Mapuzugun language. One important initiative is the language promotion campaign, through a series of indigenous language ​​broadcasts on TV and social networks. It is an audiovisual campaign to inform Chilean society about the importance of indigenous languages ​​for the promotion of aboriginal values ​​and knowledge. Furthermore, this initiative contributes to the recognition of multilingualism and pluriculturalism present in the country. They are six videos that highlight the beauty and value of indigenous languages ​​that are broadcast by TV channels, as well as DVD and Internet distribution format via social networks. The initiative belongs to the First Congress of the Indigenous Languages ​​of Chile, in July 2010 at the U. of Santiago de Chile, which was an event organized by the Network for Educational and Language Rights (EIB Red Chile) of Indigenous Peoples of Chile. The programs in the series are mostly spoken in the respective indigenous languages, Aymara, Yagan, Mapudungun and Rapa Nui, with Spanish subtitles. Seeing indigenous cultures represented on television is a rare occurence; usually non-indigenous people who do not know about aboriginal cultures. So it is important that the protagonists tell their stories without the intervention those who are not part of that world or who do not have direct experience with it. This initiative reaffirms the fact that people need to express their culture and that television is a good medium for that and which should be extended to other similar for the promotion of indigenous languages. The scripts and librettos were performed in conjunction with the characters and locations were conducted in their everyday cultural spaces. The characters are exponents of languages ​​and knowledge of their people, with public and medial presence, highlighted by his work, proud to belong to indigenous culture, with their works they teach the value of the language and culture, an ideal that indigenous need to followed, especially new generations. In the series of Indian Languages, other methods or topics of interest are the promotion of projects that belong to successful people who have traditional occupations. This allows people to see a reflection of themselves and to be inspired to create art according to aboriginal languages, knowledge and values. In general, aboriginal art is a good way to spread languages: theater, singing, poetry and panting are good examples. In Chile, the Mapuche poets and writers have made a great contribution to the writing of Mapuzugun, some make their writings in the language translated into Spanish or other languages. They recite poems and sing in the aboriginal language. So you can listen to Mapuzugun by way of the most famous poets like Chiwaylaf, Lienlaf, Graciela Huinao, Ricarfo Loncon, Maria Panchillo. Today, they are nearly two hundred people the are counted among poets and writers. The spread of languages ​​through video, covers one sector of the population, and we need initiatives to promote cultural and linguistic diversity access to society as a whole. This requires a new language policy in the country. Today, we need to change the communication system in the dominant language and to ensure public use of indigenous language as well, so that the use of indigenous languages in media becomes part of recognized fundamental human rights. The disappearance of native languages ​​is the result of a political system and years of colonialism that deprived people of their fundamental rights. That is why we need to repair and give equal space and opportunities to all languages; a new language policy that addresses the problem of diglossia and normalization of indigenous languages ​​in society; i.e. improving the social prestige of the languages ​​in mainstream society and advance standardization and development for multipurpose use. It is necessary to support the adoption of a pluri-linguistic media law as well; indigenous languages ​​should be guaranteed spaces in public media, such as radio, television and newspapers. Today there are no such spaces available; those spaces are divided according to large financial contributions that indigenous organizations do not have. We need indigenous people to have the ability to listen to their languages, to be accustomed to the language of their people and to learn speech from different regions. This will encourage linguistic intelligibility, the ability to understand each other, and thus it will strengthen the use of native languages. Also, it will allow non-indigenous people to listen to languages ​​that they have never heard before, to be exposed to their public use and this will result in strengthening these languages. It is important to have good teaching methods that will allow students to enrich their cultures and which will promote intercultural education for all society; not only for indigenous peoples. We need to make Intercultural Bilingual Education not only for indigenous populations, but it needs to be shared with the majority society. Therefore, it is necessary to make intercultural education for all, indigenous and non-indigenous; as a model for changing cultural hegemony and for the decolonization of knowledge. So far the intercultural education has been applied to the Indians as a compensatory system for students, a system for children to improve their learning and to achieve the goals of the national curriculum. Making the commitment of cultural inclusion of indigenous peoples in the education system will improve indigenous identity and self-esteem and as a result, it will enhance educational achievements as well. Today, not everyone shares that idea; however, as long as this initiative is not incorporated into national law and policy, the colonial model is allowed to persist. The outcome of that situation is a restricted intercultural dialogue between cultures. Intercultural bilingual education for all children and young people will introduce new values ​​and knowledge to live with, which will help form a new mentality about interethnic relations, interaction and exchange of knowledge. The majority non-indigenous society needs to rethink its official history and should learn about the indigenous genocide that took place during the formation of States. The need to include indigenous professionals and specialists is a curricular challenge that affects the development of new curricula to convene the dialogue of knowledge, to know each other without the prejudices of racism. The indigenous people themselves know their cultures and are primed to make a selection of topics and values ​​so that they can be incorporated into the national curriculum. No doubt linguistic normalization is the axis that will allow the modernization of the native languages, allow their vocabulary to evolve in parlance with today’s culture, define grammatical rules and stabilize phonic paintings. All of which are necessary to achieve to allow native languages to develop and to ensure their multifunctional use in modern Indian culture. The role of States, the United Nations system, to support the survival, revival, use and promotion of indigenous languages. The creation of Institute of Indigenous Languages, with state policies and shared management between indigenous and state institutions is necessary. Among the major tasks of this entity is to monitor compliance of linguistic rights as are recognized in the C 169. As well as to check-indigenous voices, oral traditions, songs and speeches, which are the linchpins of knowledge and cultural wealth. Also, international cooperation agencies should create a fund for recording a corpus of indigenous languages, as well as the revitalization of languages.